The Cardboard Connection is the fastest growing, go-to source for collectors, investors, and anyone else looking to sell and /or consign their collections. We bring the same integrity, collector-centric business practices, and brand recognition to selling and consigning collections as we do to our editorial coverage of the sports card, entertainment trading card, and memorabilia industry. This has allowed us to provide you with extremely honest and reasonable, top-dollar offers on collection purchases and among the highest returns on consignments in the business. In order to ensure we can provide the best possible offer, we use a combination of directly purchasing and consigning collections as well as outsourcing leads using exclusive deals to the top buyers in the business with the goal of ensuring you get the best possible return on your collection. If you are looking to sell cards or memorabilia, simply fill out our sales lead form here. Joe Tinker’s Chicago Cubs claimed three league pennants in a row from 1900 to 1913, which is the same number that Honus Wagner’s Pittsburgh Pirates, and Ty Cobb's Detroit Tigers did during that span. Wagner’s and Tinker’s teams often squared off against each other with “Wagner marveling at Tinker’s defensive ability on the field, while Tinker had the utmost respect for Wagner’s powerful hitting.” Joe Tinker’s Cubs also played against Ty Cobb’s Detroit Tigers, even defeating them in the 1907 World Series four games to none, with one tie. 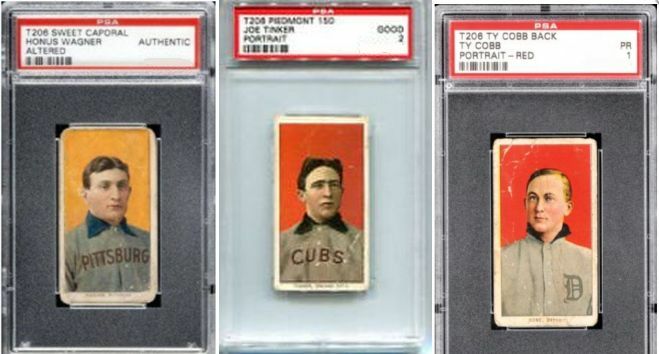 Further showcasing the connection, Tinker appears on the same checklist as Honus Wagner and Ty Cobb, his Hall of Fame counterparts, in the iconic 1909-11 T206 set that is immortalized by the most expensive baseball card ever sold. All three players were so popular among collectors that they shared spots in a multitude of sets for many years, including what was a mostly overlooked release until now. That set is 1960 Fleer. What makes 1960 Fleer now stand out for collectors is specifically card #80, a card that Fleer presumably tried to keep out of circulation. Because the card never made it into the printing press’s normal rotation, it ended up as a combination of a standard-issue player on front — Joe Tinker — and a non-standard issue player on back — Pepper Martin. The Tinker/Martin-Back #80 cancelled error card is far more scarce than both the T206 Honus Wagner and the T206 Ty Cobb with Cobb-back. 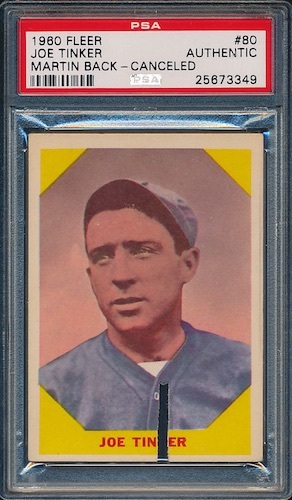 As of this writing, there are 16 PSA T206 Cobb-backs and 34 PSA cards of the famous T206 Wagner. By contrast, PSA has only slabbed three examples of the Tinker card, with no known public auction results or pictures available in either raw or graded form from any company. Based on this information, the rare Tinker/Martin-back is roughly five-times harder to find than the Cobb-back, and an astounding eleven-times more scarce than the Wagner, putting the value of the Tinker card in the priceless range. To add to the allure of this amazing find, there are no recent or even historic sales to compare it against. The few pieces of information that can be found allude to a card that was either hand-cut, and/or apparently was not the distinct cancelled variation. This newly-uncovered example, now live at auction, was found in a large boyhood collection of pack-pulled 1960 Topps and 1960 Fleer cards. It checks in with standard-issue measurements, making it virtually guaranteed to be straight from a bubble gum wax pack. Taking into account the total number of a given card in circulation is a defining characteristic of baseball card value. This would put the Tinker card in a class of its own, even when compared to the most illustrious and valuable baseball cards ever. The distinguished 1952 Topps set and, in particular, the Mickey Mantle in that release, is so important because of the low number of cards currently in circulation. It was the story of large quantities of those cards being dumped in a river that made them prominent in the mind of many collectors. Likewise, with the Tinker Card, the story of Fleer trying to keep the card out of circulation makes this impossible find even more nostalgic. The only real difference between the two is that Topps made their cards rare in the process of unloading excess inventory, and Fleer, based on what little information is available, appears to have kept the cards out of the market on purpose. With that said, unlike modern day baseball card manufacturers, who issue short print cards to create value, the Tinker card is in a league of its own with truly limited quantities available. Because of the lack of historical auction results and media coverage due to the Tinker card’s scarcity, the market will make its own price now that this public auction is listed on eBay. Comparatively speaking, with the other cards mentioned easily reaching 6+ figures, anything significantly below that for the Tinker card would be a bargain. 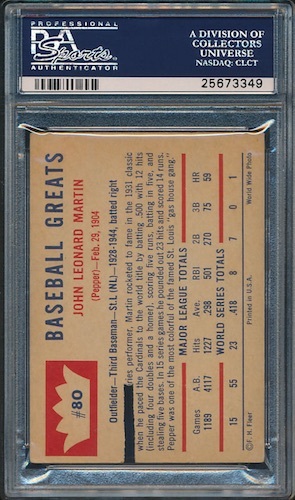 Given that modern day baseball card companies and collectors spend millions of dollars each year producing and chasing planned error cards, true error cards like this provide an incredible opportunity. The Cardboard Connection offers free appraisals on rare and valuable baseball and other sports or non-sport cards. Our team of experts can advise on the best way to liquidate or consign treasured collections, ensuring a fair and comfortable transaction. 1960 Fleer #72-Ted Williams-PSA VG 3 - Free Shipping! 1960 Fleer #63 Red Ruffing Yankees HOF "Autograph grades 9!" SGC !! It’s funny that we all feel the old cards are where the true rarity or value has to be on the old cards. Some of the newer cards are “much rarer” and we know the name of the players. I could go on to many more. You bring up a good point there, and I agree with you. Depending on what you collect, rare items carry varying amounts of value for each collector. I for one appreciate the rarity of both older and modern cards. Additionally I enjoy learning about what makes certain players or cards desirable to other people, which may or may not expand my personal pallet. Thank you for your feedback! I have several hundred 1990-1997 NBA cards. Can you tell me a little about what I have. Read Ira Higgins 2016 article on 1960 Fleer #80 card; Joe Tinker/Pepper Martin with cancel cut. Have one in good shape. Am original owner. Article says could be worth much. Please reply.